Convert a straight line to a curved line, or convert a curved line to a straight line. Add additional points to a shape. Remove points from a shape. Extend an existing open shape. Position the cursor where you want the first straight line segment to begin. The cursor will show to indicate you are about to begin a new path. Click to define the position of the first point. Click again where you want the first line segment to end. Note: Press the shift key to constrain the angle of the line to a multiple of 45°. Continue clicking to add more points and line segments to the path. To create a closed path, position the cursor over the first point. The cursor will change to when positioned correctly. Click to close the path. To leave the path open, hold the <Ctrl> key down and click, or select a different tool from the menu. Position the cursor where you want the first curved line segment to begin. The cursor will show to indicate you are about to begin a new path. Hold the mouse button down to define the first point of the curve. The cursor will change to to indicate you are defining a curve. 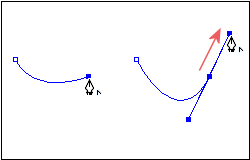 Drag the cursor to set the slope and direction of the curve segment. Release the mouse button. A - Positioning the cursor. B - Holding the mouse button down. C - Dragging to define the curve. Continue clicking and dragging to add more points and line segments to the path. Use the Select Point Tool to select the required shape. The cursor will change to to indicate a new point will be added. The cursor will change to to indicate an existing point will be deleted. Either click on an existing point to delete it, or click on a line segment to insert a new point. Holding the Alt key down, click on an existing point and drag the control point to a new location. Note: The cursor will change to when positioned correctly. Holding the Alt key down, click on an existing point to convert it to a straight line. While in pen mode you can temporarily switch to the last select mode, by holding down the <Ctrl> key down.